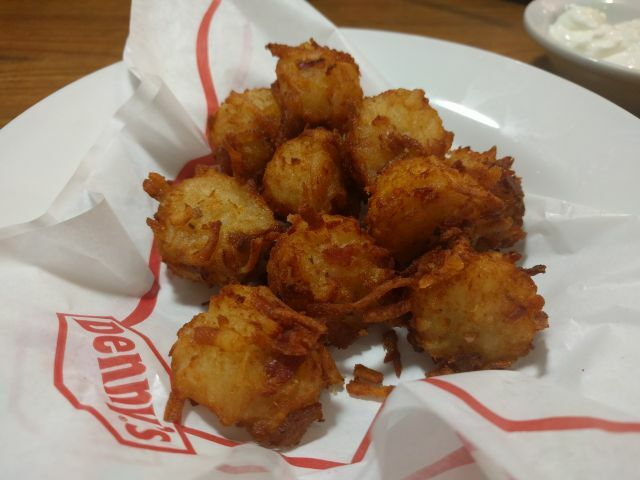 Denny's Bacon Cheddar Tots feature tots made with shredded potatoes, bacon, and cheddar cheese. Sour cream comes on the side for dipping. An order cost me $3.99 and include ten tots. The tots are bigger than your standard tater tots but are still bite-sized. They're hand-made which gives them a looser, softer texture than you get with fried frozen tots. The potato taste comes in a bit more prominently given the freshness and larger size. The cheddar and bacon help make up part of the crust of the tots and add an extra crunch from the fryer. In addition to the surface, there's also a bit of melted cheese in the interior for a mild cheddar flavor throughout to pair with the light hints of salty smoke from the crispy bacon of the exterior. The tots go well with or without the sour cream but I prefer them without so I can get more of that cheesy, bacon potato flavor. 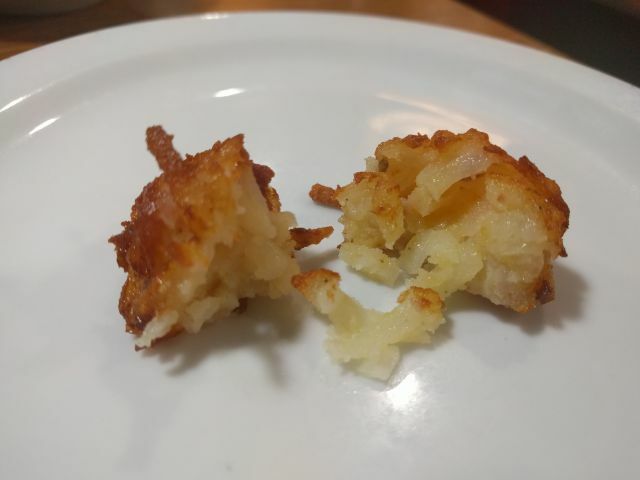 Overall, Denny's Bacon Cheddar Tots are quite nice with an enjoyable take on a pretty tried-and-true combination. You generally cant' go wrong with bacon, cheese, and potatoes and that's much the case here. It does seems a buck too pricey for 10 bite-sized tots though.